Heavy and prolonged rain resulted in some delay with the excavation at the High Pastures site last week, with only two days work at the beginning of the week. However, with help from our volunteers we have been able to open up new trenches to investigate other aspects of the site. Read on for more details and images. Monday and Tuesday of last week produced dry and sunny conditions at the High Pastures site, allowing good progress to be made in the trenches. Having uncovered the potential structural stonework in the bottom W corner of Trench 2, we have had to make a decision to extend the trench. A 2 metres square column of material will be removed from the section shown above so we can hopefully pick up the other side of the structural stonework. This will involve the removal of a considerable amount of material, but is necessary so we can continue with the excavation of Trench 2 to gain access to Bone Passage. Meanwhile, excavation is progressing well in Trench 3, near to the entrance of the roundhouse, while a new trench (Trench 4) has been opened up on a flat grassy platform to the east of Trench 2. 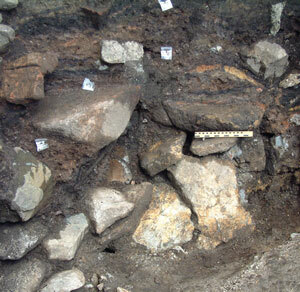 This trench, which measures 2 metres x 1 metres, is being excavated by Ann and Mike Kibby, who will also be recording the trench during the different stages of excavation. Away from the excavation, Steven Birch presented a paper on the archaeological fieldwork undertaken at the High Pastures site during the past two years. 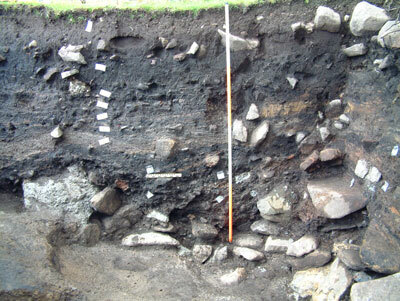 The paper was presented at the ‘Archaeological Research in Progress 2005’ Conference at the Lecture Theatre, Royal Museum, Edinburgh. The conference was organised by the Society of Antiquaries of Scotland and the Council for Scottish Archaeology. The lecture was well received and Steven had the opportunity to discuss the High Pastures site with an experienced core of archaeologists and specialists carrying out fieldwork in Scotland. 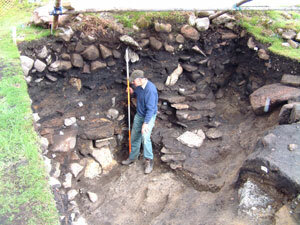 Steven has been invited back to deliver a more comprehensive lecture on the High Pasture Cave Project later this year. Unfortunately, the excellent progress made at the High Pastures site during the earlier part of last week was abruptly interupted by the continuous rain, which lasted from Wednesday through to Friday. However, the day dawned fine and clear today (Monday 6th June), allowing us to continue with our work at the site. Visit the website later this week to see how we have got on. Never seem to see you guys these days! Thanks to your website at least I get a chance to see a photo or two of you (in case I forget what you look like...) Glad to hear it is going well, in spite of the rain. Don’t get trench-foot!